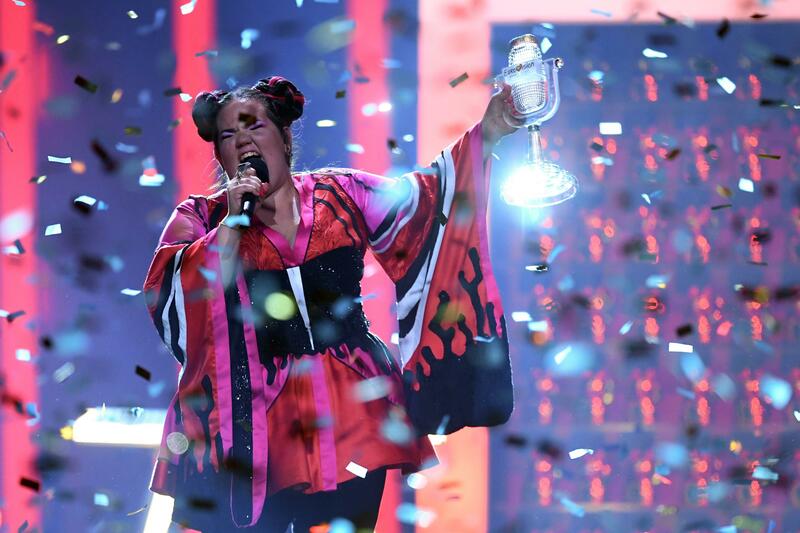 LISBON, Portugal -- Pre-competition favorite Netta Barzilai won the 2018 Eurovision Song Contest for Israel on Saturday with her song "Toy." Barzilai beat out competition from 42 other countries' performers to claim the music extravaganza's annual crown at the Grand Final in Lisbon, Portugal. There was a strong field of contestants at this year's event, and the Israeli entry topped close competition from Cyprus, Austria, Sweden and Germany. Barzilai racked up 529 points, compared with 436 for runner-up Cyprus and 342 for third-place Austria. Certainly among the press, Netta had been written off – with Cyprus, France, Ireland and Italy thought to be the more credible acts, BBC News reports. By the half way point in the scoring, though, the national juries had confounded this and she was in a strong third position. And then for the public vote: The 25-year old gained the highest number of points possible from viewers at home. The contest largely shed its traditional hallmarks of glitz and glitter in favor of a more restrained and tasteful tone in Lisbon, which was hosting the event because it won last year with Salvador Sobral's sober and subdued ballad "Amar pelos Dois." Sobral last week criticized "Toy" as "horrible music." But Barzilai was unrepentant with her popular techno dance beat about women's empowerment. Her win -- Israel's fourth and first since 1998 -- means her country hosts next year's Eurovision Song Contest, which is watched by some 200 million people. "Next time in Jersualem!" Barzilai shouted to the audience as she picked up her award. "I'm happy people chose something different. It's refreshing," she said. The international contest began as a competition between European countries, but its huge popularity has led to the inclusion of Israel and Australia among the performers. Barzilai, known more usually as Netta, is a sassy woman with a witty on-stage personality. Before the Grand Final, her song had already racked up more than 20 million views on Eurovision's YouTube channel. In "Toy," Netta makes funny noises, including a clucking sound like a chicken and barely decipherable words, and uses a looping machine and synthesizer. The lyrics say, "I'm not your toy, You stupid boy, I'll take you down." Portugal came last, with 39 points. Fans caught their breath when a protester ran onto the stage and snatched away the microphone of the United Kingdom's contestant SuRie. The man got hold of the microphone but was quickly tackled by security and taken away while SuRie stood by. The British singer kept her composure and picked up her song where she left off. Previous editions of the annual event have also witnessed protesters getting onto the stage. The event is organized by the European Broadcasting Union, an alliance of public service broadcasters.